This article posits: "Upscale, one-story houses in Texas included “conversation pit” in front of the fireplace. Frank Lloyd Wright developed this idea before World War II, but it wastes space by being inflexible." Q: Any truth to this claim? I have also heard a similar comment regarding Wright "inventing" the carport. Q: Any truth to that claim? The floor plan in the article seems to be missing "something." There is no evidence that Mr Wright either conceived of or built a "conversation pit"; that idea was left to others to explore, most notably Cranbrook- or Harvard-trained practitioners from the war years and beyond. Saarinen's Miller house and Franzen's Beatty residence come to mind. 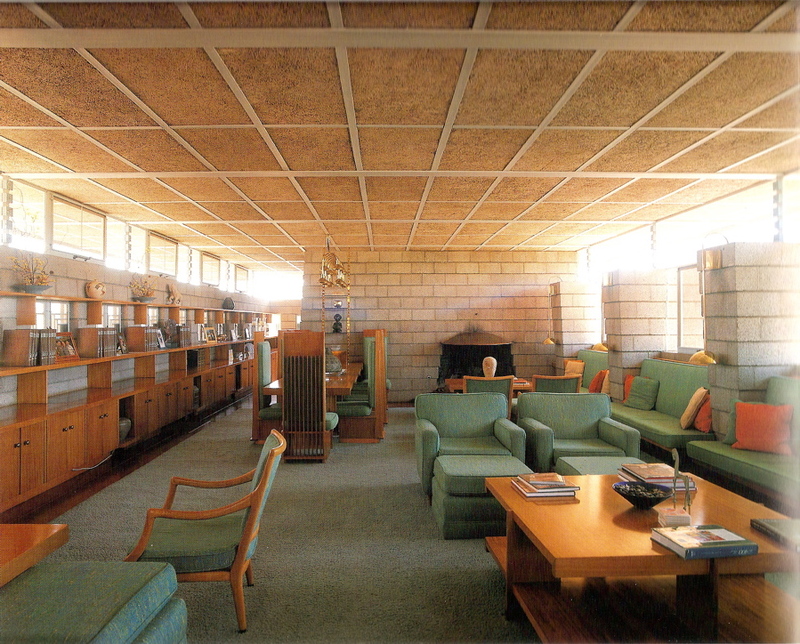 The closest thing in Wright might be the Christian Usonian (1954) with its change of level in the living room, designed to accommodate groups of guests. A similar arrangement, with similar intent, is found at the Entenza residence (Case Study #9, 1949). The carport may in fact be Wright's invention, at least in the form of a cantilevered "tongue" protruding from the building. It would be hard to argue for his pioneering of a covered but open-air vehicle parking place, however. 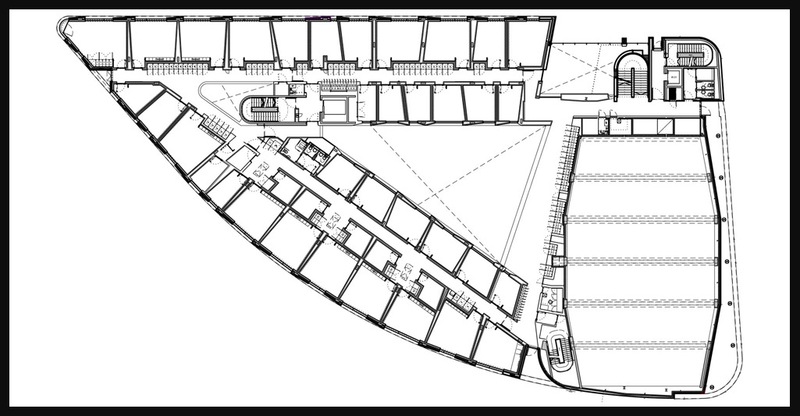 The floor plan of the (anonymous) author's third house is idiosyncratic, if nothing else. His comments on the acoustic issues associated with the open plan, on the other hand, are worth thinking about. Yep. But, the kitchen does have "Cold" and "Hot" . . . something. I scanned this article a few times looking for the quote on acoustics, and didn't see it... Any help? I even scanned through most of the comments, which seemed to diverge into much talk about Obama's proposed library building. Plus lots of "I don't like Gehry" commentary. Not very deep stuff, but it made me curious as to the Chatters views of Gehry. I'll be reviving the thread on him shortly. "The present Open Floor Plan (Kitchen, Dining, Family) tries to compensate for smaller houses, but it mimics the 1930s Usonian homes of Frank Lloyd Wright and others. Kitchen work has gotten noisier rather than quieter, in at least one particular: the increased use of juicers. discussing the Usonian kitchen, it was in that sense, and not in reference to conversation or acoustics. Ahh I see. It was about the kitchen noise. I thought maybe it was concerning the general acoustic properties of the space. 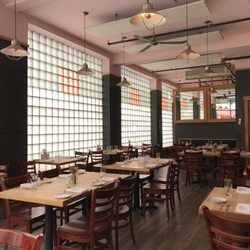 Since moving to Asheville NC, I've noticed quite a few restaurants have installed acoustic panels in their dining areas to tame sound reflections. I'd never seen that, outside of movie theaters and music studios (slabs of rigid fiberglass covered in breathable material to absorb sound). I personally find these panels to be aesthetically pleasing, maybe they could work in a home living room space if needed? 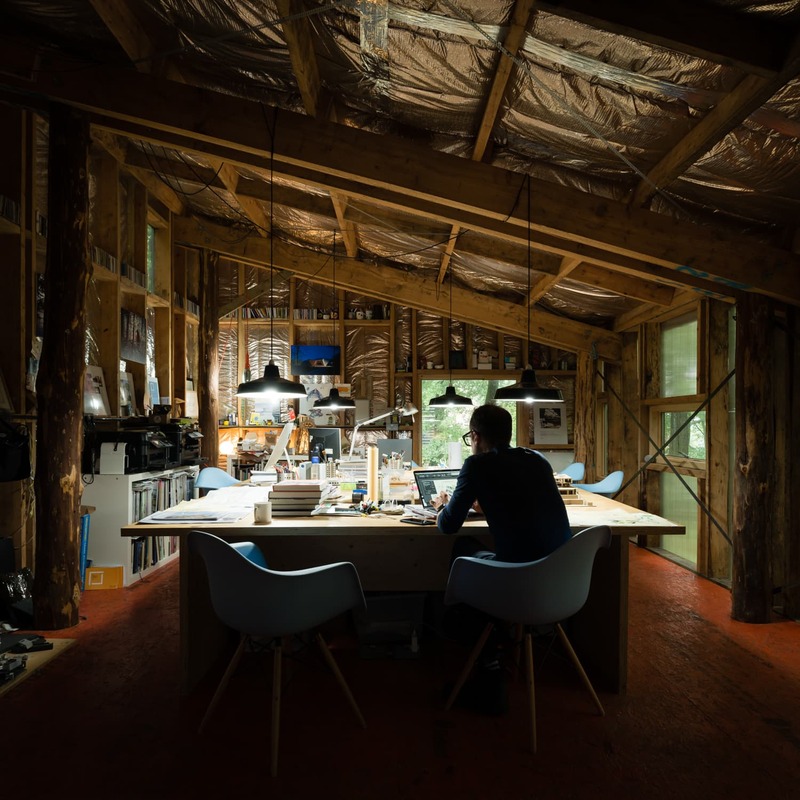 I also recall the English architect Piers Taylor using exposed insulation in the rafters of a drafting studio he built, which I assume made for a quiet acoustical space. walls, and ceilings, to major formal moves. When I see insulation such as that in the last photo, I think of thermal control rather than echo reduction. When I see insulation such as that in the last photo, I think of thermal control rather than echo reduction. Obviously. But a perhaps unintentional effect might be pleasing acoustics. From my understanding, rectangular and square rooms can be not only reverberant, but due to the way frequencies interact with each other via "reflections", they can lead to strange sounding rooms in general. "Boomy" and "boxy" might be the adjectives used, and not in terms of echoes. Wright was obviously conscientious about acoustics and his spaces dispersed sound, as well as light and "energy" in many ways. But for everyone else, such as restaurants and $15,000 drafting rooms, I'd think the efforts to produce pleasing sounding rooms is a worthwhile endeavor. jay, when was the last time you patronized a restaurant? They purposely make their interiors so loud that it is almost impossible to have a conversation without being within kissing distance of your date. The one space by FLW that I found had bad acoustics is the domed area in the Morris Gift Shop. If you are seated - and it is designed to be used that way - it is okay. But if you stand, the reverberations hurt the eardrums. Many restaurants are "loud." If that's done on purpose, I wonder what the purpose is . . . I sit outside whenever I can. I'd rather talk to the sparrows than listen to other people's choice of music, and the din when it's busy. The purpose of restaurants being deliberately loud is to convince customers that this is where lively people go, where the "action" is, etc. Just another aspect of all the noise that now characterizes American popular culture, "popular culture" being an oxymoron in itself. Look how polluted even the N.Y. Times now is. Thank you. I certainly got that impression when, sometime in the early 'eighties, a "hot" Chicago deep-dish pizza restaurant opened a San Francisco location on Lombard Street. An employer took me there, and we could barely hear each other. It was bizarre . . . and annoying. Maybe all they need is one visit by each patron, in order to "make it" ? Only a masochist would return for a second meal---it seems to me. About 2 decades ago, Loo Tee, Ginny Kazor and I had dinner at a popular Italian restaurant, Louise's Trattoria, in Larchmont Village. The walls were covered with large mirrors, and the noise was so loud that, even though we sat at a small table, we could hardly hear one another. Louise is still there, so it must work ... perhaps with millennials. The food was good, but the atmosphere was unendurable.